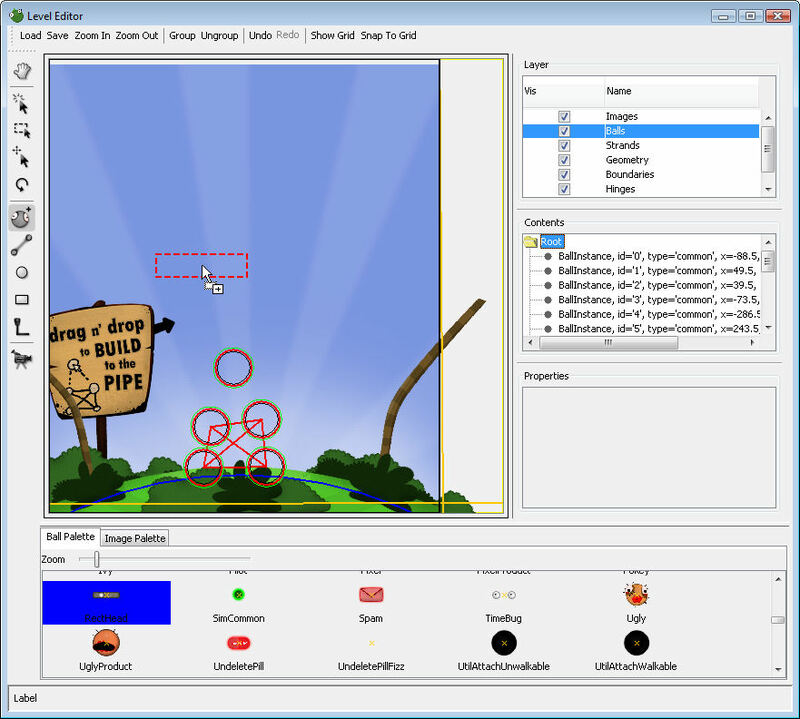 GooTool 0.10.2 is out, another small step along the road to 1.0 while xanax distracts me with the level editor. This version lets you backup and restore your profile to this site, giving you a quick and easy way to make backups and also to transfer profiles between machines (even between Windows/Mac/Linux). This doesn't share your profile with anyone; that's a separate option "publish profile" that is not yet finished. You can store up to 10 profiles on this site (let me know if that's not enough). After that, the oldest profile is deleted. You can also "preserve" backups using "My backups" on the right-hand navigation, preventing them being deleted this way. Also in this version are some other improvements, mostly for the Linux version and forthcoming 1.40 World of Goo. Read on for the changelog. In 2dboy news, Kyle found time to release the soundtrack, and the Linux beta is now complete and it should be released soon. I've just released GooTool 0.10.0. This is the first release of the 0.10 series and it adds support for Mac OS X, preliminary suppport for the Linux beta, and a proper installer for Windows users. I didn't get a chance to finish everything I wanted to, but I wanted to get the Mac port out as soon as possible. But there are a number of other changes too, read on for the changelog and roadmap. The goal is to complete all the new features in 0.10.x quickly and have a stable 1.0.0 release, so please report any bugs you find. 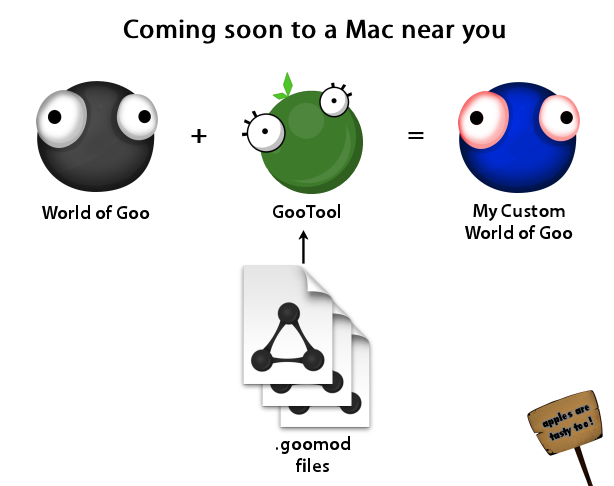 In other news, I've started documenting the game file formats on this site. I believe it's fairly straightforward for me to add people as editors, so just create an account here and let me know if you wish to contribute. It's been revealed that the Linux port is being done by none other than Soultaker (maks), a well known face to 2dboy forum visitors. If you want to keep on top of progress or join the beta, sign up to the Linux mailing list. Update: a beta version is out already. In other news I've finally fixed a major problem with internationalised text in goomod files, so GooTool 0.10 will be out shortly. So Jingle Balls seems to have become quite a success. Although not quite as polished as we'd wanted due to time constraints (we couldn't convince Santa to move Christmas), we've learned a lot for our next developments. If you weren't able to play the level or are interested in seeing the walkthrough, videos of both the normal and the OCD solutions follow. Read more to watch them. I'm currently porting GooTool to Mac OS X. However, for some reason Apple have decided to make Java 1.6 available only for 64-bit Intel Macs. Backporting GooTool to Java 1.5 is going to be rather a pain, so I'm doing a quick survey to see what types of Mac people actually use. If you have a Mac, please vote over here. Thanks to all goofans for making Jingle Balls the #1 most downloaded World of Goo custom level ever!! (ho, ho, ho). I just made inlay graphics for CD jewel cases; I had to burn Mac versions of the game to CD since RTL didn't manage to replace my CDs in time (they forgot to include the Mac installer on the "multi-format" German CD). I thought I'd share them in case anyone else finds them useful. Read more to see them. The Goo Balls were nestled all snug by the fire. In hope of avoiding the Sign Painter's ire. I'm very excited to announce the release of "Jingle Balls", a new level developed by Sébastien Kerguen, Cosmin Mirza and myself. Check out the trailer and download the new level here. We hope you enjoy it. As you can see, the site has a new theme. I'm not particularly happy with it, but I have no artistic talent whatsoever. If anyone can help out, please get in touch! I've been busy working with xanax and Cosmin Marza on a new level for Christmas, "Jingle Balls". This is in beta test now (e-mail me if you want to help test) and should be out by Monday. In the meantime I've just released GooTool 0.9.6, with a number of bugfixes and usability tweaks and a couple of new features. Highly recommended especially for those using game in languages other than English. Update 22:15: I've had to release 0.9.7 to fix another problem in accented characters. Not necessary if you just downloaded 0.9.6 and you're only playing in English. Read on for the changelog. It's been a while since I've posted, what with work, a significant birthday (I'm now officially old) and a rather nasty rootkit trojan. So here's a quick update. 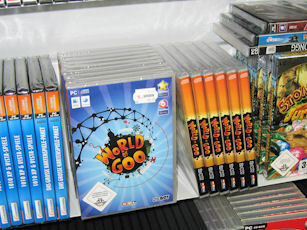 World of Goo is now out in some stores in Germany a day early, although unfortunately tucked away in the budget section. I bought some copies anyway to teach them a lesson. The moon chapter is conspicuously absent. Hopefully it'll be available in a sequel or download at a later date. 0.9.5 is now out. The major additions are Linux support and new version notification, along with a couple of bugfixes. Download it here and please report bugs here.